Friends, it's really hard to go back to writing about theater when half of the country is devastated, and I happen to be in that half. But maybe now, when politics and politicians have failed us, is when we need to turn to our artists. Our playwrights, our actors, our painters, our sculptors, our dancers, our comedians, our musicians. To heal our wounds, to bring people together, to make sense of the world, to promote social justice and equality. The Oldest Boy perhaps doesn't seem on the surface to be a profound political statement Rather it's a simple story of love, faith, and non-attachment. Which perhaps is the most profound statement of all, and one that I, for one, would like to focus on today of all days. The world was a different place when I left the Jungle Theater last night than when I entered it, but for two hours but I was immersed in a world of love, learning, sacrifice, faith, and hope. The last time playwright Sarah Ruhl, director Sarah Rasmussen, and actor Christina Baldwin combined forces it was for the lovely In the Next Room four years ago. This play, while quite different, is also lovely in it's own way. The Oldest Boy explores the ideas of faith and a mother's love in a compelling way. When a mother is told that her almost 3-year-old son is a reincarnated lama (a Buddhist teacher), and the boy himself exhibits some proof of that, she must decide if she's able to make the ultimate sacrifice and let him go so that he can study at a monastery with his former student to become a great teacher once again. Sounds crazy, doesn't it?! Yet it happens - there is a "little lama" living in Colombia Heights, born to Tibetan parents (Minnesota has the second largest Tibetan community in the US). At nine years old he's already studying languages and the teachings of the Buddha, and preparing to go to a monastery soon. 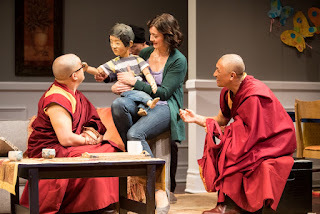 In this fictional play, little Tenzin's father is Tibetan while his mother is a white American. She has been studying Buddhism since marrying Tenzin's father (the play includes a flashback of their meet cute, and the not so cute obstacles they faced to be together). Not having grown up in the tradition, it's a little harder for the mother to accept that her son is a wise teacher. The second act sees the family in India, where impossible choices must be made. In addition to Christina Baldwin, who gives a wonderful, natural, heart-breaking performance as the mother, the excellent and mostly local cast includes Randy Reyes as the father, Eric "Pogi" Sumangil as the friendly lama who discovers Tenzin's true identity, and Tsering Dorjee Bawa (who appeared in the original Off-Broadway production, as well as two other productions of this play) as a monk and the cultural consultant for the piece. Playwright Sarah Ruhl has solved the problem of a 3-year-old main character by having Tenzin be played by a puppet. Puppet designer/puppeteer/actor Masanari Kawahara brings the child to life with equal parts playfulness and old soul wisdom. The play includes several scenes of traditional Tibetan dance and ritual. Outside of the Festival of Nations, it's rare for most Americans to be exposed to the rituals of other cultures, and it's fascinating and eye-opening to observe. The second act set feels authentically foreign, in contrast to the clean and modern American home seen in the first act (scenic design by Mina Kinukawa). At this point moving to India to study at a Buddhist monastery doesn't sound like a bad idea; it seems so lovely and peaceful, centered and purposeful. The Oldest Boy is a sweet, funny, poignant play about understanding other cultures and oneself. 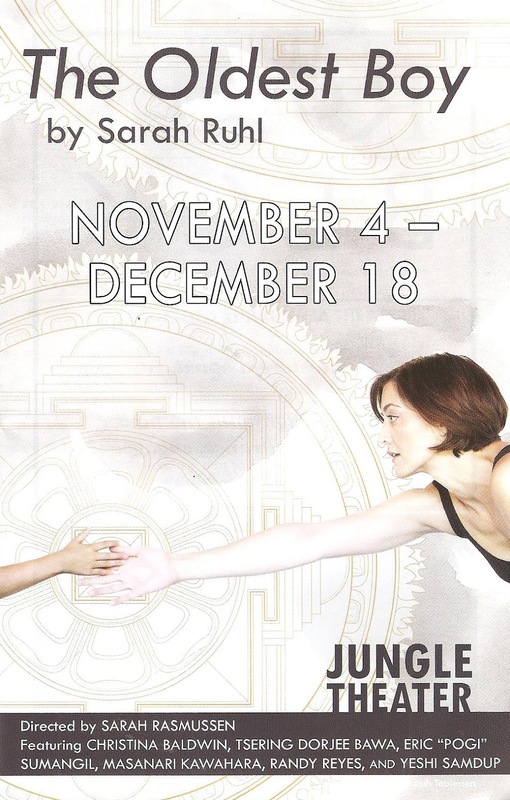 Not a bad choice for the post-election holiday season (continuing through December 18 at the Jungle Theater in Uptown - allow plenty of time to find parking).